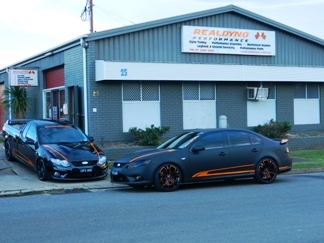 Real Dyno Performance carries out a large range of performance modifications and services on a range of FORD and FPV vehicle types. From your daily driver to a street machine or track weapon, we have the tools and expertise to transform your FORD or simply keep it running smoothly. Take your time to browse our website and if there is anything that is not listed makes sure to call us for more information. With our latest workshop, we can offer a more personalized service, we are also able to offer high quality services such as tuning, performance upgrades, brake packages, exhaust systems, even general and log book servicing. With high quality workmanship, facilities and an extensive range of performance products, we are more than able to cover your needs.